but the Lord rescues them from each and every one. I wanted to draw a brown pelican for a long time before I could finally catch one with my camera. When given the assignment in a pen and ink class to draw a bird, I thought it was the perfect opportunity. I chose one of my pictures of a pelican coming in for a landing. They are such clumsy looking birds when they land. 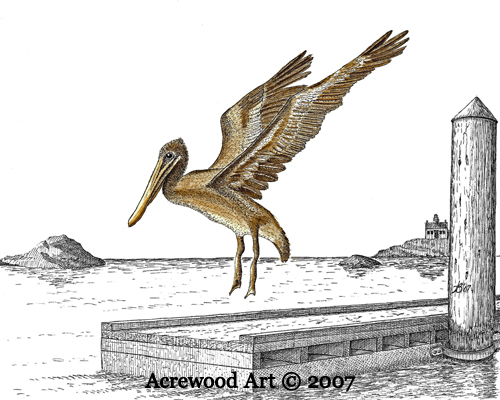 This young pelican, Fred, looks like he is going to overshoot the end of the dock. Doesn't it make you want to shout, "Pull Up! Pull Up! "?